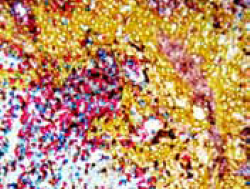 High Sensitivity, Low Background Multiplex Immunohistochemical (IHC) Analysis from Enzo Life Sciences, Inc. Continuing our position as a leader in detection technologies, Enzo Life Sciences offers a convenient set of tools for single-color and multi-color immunohistochemical (IHC) analysis, featuring MultiView™ multiplexing kits, PolyView™ reagents, and the market’s broadest portfolio of HighDef™ Chromogens. Combined with over 1000 IHC validated antibodies and a complete set of ancillaries, Enzo offers all the tools to run an efficient IHC assay from start to finish. MultiView™ detection kits offer a complete solution for multiplex IHC, providing increased efficiency, reduced reagent use, and preservation of precious tissue samples. Each kit includes biotin-free nanopolymer-based PolyView™ detection reagents to reduce endogenous biotin-associated background, HighDef™ chromogens for crisp two-color development, as well as buffers and blocking reagents. The flexibility of PolyView™ reagents and MultiView™ kits simplifies custom multiplex protocols to enable up to four-color staining within the same tissue sample. Our industry-leading palette of HighDef™ chromogens provides the most choice in color options, featuring HighDef™ Yellow HRP, and including multiple horseradish peroxidase (HRP) and alkaline phosphatase (AP) options. The portfolio also includes streptavidin-based SAView™ detection kits for improved sensitivity and background compared to ABC detection protocols, also compatible with HighDef™ chromogens. Our growing catalog of over 1000 IHC validated antibodies includes those for the detection of key signaling proteins, cell surface markers, cytoskeletal proteins, protein expression & folding, cell death, and more. Every Enzo antibody is backed by our Worry-Free Trial Program and expert technical support. With a broad selection of ancillary reagents for antigen retrieval, wash buffers, antibody diluents, and HighDef™ mounting medium, Enzo can help streamline simple and complex IHC assays from retrieval to coverslip. For more information or to order IHC Detection Products or other Enzo Life Sciences products, please visit us at www.enzolifesciences.com or call us at 1-800-942-0430.